Appleton Estate 50 Year Old Jamaica Rum – Jamaica Independence Reserve, was awarded two major accolades at the Golden Barrel Awards which was held in London last week as part of UK RumFest 2012. 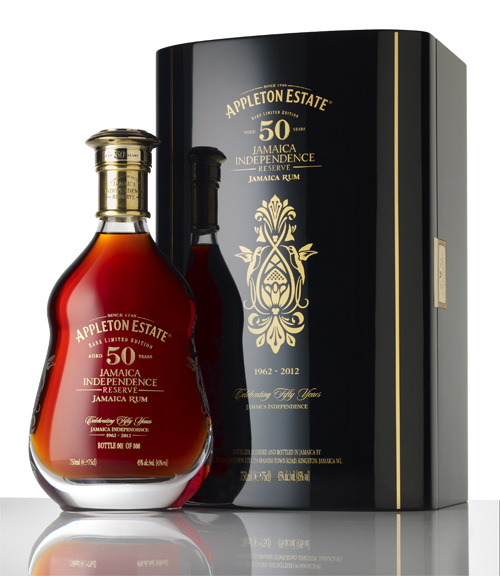 Appleton Estate 50 Year Old Jamaica Rum – Jamaica Independence Reserve, won awards for the ‘Best New Golden Rum’ and ‘The Best New Rum Packaging and Presentation’. The Golden Barrel Awards recognizes new entrants to the rum category, as well as those persons who have made an outstanding contribution to the recognition of rum as a major sprits category world-wide. Last year Appleton Estate Jamaica Rum’s Master Blender, Joy Spence, was awarded the Rum Experience Pioneer Award for outstanding rum achievement. To take two of the evening’s 12 awards was a significant achievement and Paul Henriques, Managing Director of J. Wray & Nephew Limited in commenting on the awards noted ,“We are very proud of the Appleton Estate 50 Year Old Jamaica Rum – Jamaica Independence Reserve, which is believed to be the oldest commercially available rum in the world. The rums that make Appleton Estate 50 Year Old Jamaica Rum – Jamaica Independence Reserve were specially set down over 50 years ago and very carefully managed over time to create this minimum aged 50 Year Old Rum to celebrate the 50th Anniversary of Jamaica’s Independence. This very rare, Limited Edition rum was launched in June of this year at Jamaica House.